When creating a "Tab Panel" and leaving the 1st tab blank (or even any number of tabs (e.g. 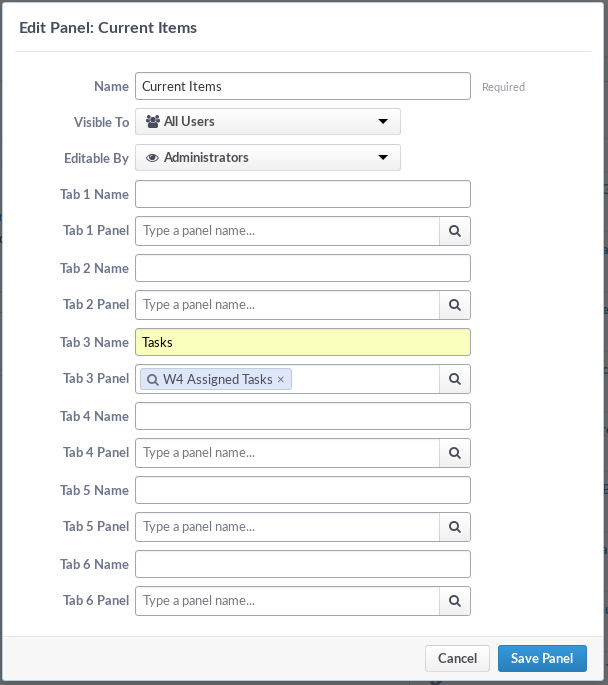 1/2 blank, 3 assigned), the whole "Tab Panel" configuration will be lost when saving. This was accidental and I just feel like this is bad UX (losing existing configuration on submit). @epriestley as far as I can tell, empty tokenizers do not POST an input to evaluate. We should still be able to handle this case, but I can take a look at what's happening since this is a nonstandard element and the fix is probably easy once I understand what's going on with the logic. I just plan to fix the bug. That's the hard part of a 2-person team with thousands of open issues. Pick and choose the battles. Yeah I can't seem to fix this ad hoc. My guess is it's never worked to allow you to skip the first tab. If I fix the error states, it then breaks existing tab panels. So we'd need to build a migration. chad added a subscriber: benwick. T12708 is the same root bug. This was more engineering than I could handle. chad added a subscriber: aik099. epriestley added a commit: rPa35fda2019bb: Rebuild Dashboards on EditEngine: v1 Major Jank Edition.